Magnafire is one of Mona's microgames in WarioWare: Twisted! The name is a pun on "magnifier". 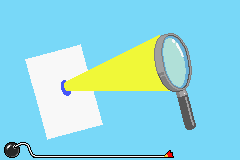 The purpose of the game is to move the magnifying glass to focus the light on the spot so that it burns a hole in the paper. 1st level difficulty: The spot is large. 2nd level difficulty: The spot is small. 3rd level difficulty: The spot is smaller. This page was last edited on September 19, 2018, at 20:52.